ICOMIA was formed in 1966 to bring together in one global organisation all the national boating federations and other bodies involved in the recreational marine industry, and to represent them at international level. IFBSO has adopted the calculation standards and definitions developed by the international exhibition industry association UFI. A not-for-profit organisation since 1931, BPA performs audits in more than 30 countries. The organisation provides 2,800+ audits for media channels in print, online/digital and live events, as well as compliance audits to industry standards such as ISO20121 and GRI. 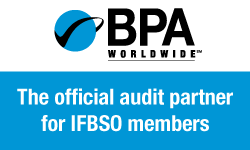 BPA is pleased to have partnered with the IFBSO to offer cost effective audits to all IFBSO members. Global offices can be found in the USA, UK, Canada, UAE and China. IBI is unique. For more than 50 years it has been reporting on the international leisure marine industry – no other business-to-business publication can boast the breadth or depth of its reporting across the global boating scene. With an experienced network of journalists working on the ground in more than 25 key boating markets, supplying content on a daily basis, IBI is requested by over 11,000 key industry personnel with an estimated pass on readership of 21,000 and remains the industry’s most trusted news and intelligence source.Often referred to as the marine industry’s ‘bible’, five decades of industry insight has given IBI a unique perspective. IBI's country reports have become a mainstay for those looking to research emerging markets, or to gain fuller understanding of the markets they operate in. Whether it’s the latest new products, company financials, boat show reviews or equipment sector reports, IBI magazine, the website (ibinews.com) and daily newsletter are invaluable resources for anyone involved in the business of boating. Soundings Trade Only is a marine business-to-business information multi-media brand. It includes a monthly print publication and digital entries including an e-newsletter, web and social media sites. Soundings Trade Only offers the latest business news, and information about products, trends, statistics, management and marketing insights, and more to the marine industry. It is part of the AIM Marine Group which includes other publications including Yachts International. Power & Motoryacht, SAIL, Anglers Journals, Soundings, PassageMaker and Woodshop News. The AIM Group is a division of Active Interest Media.